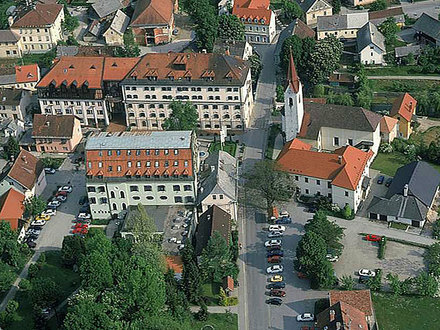 The Termal boarding house Dolenjske Toplice offers 37 beds in the very center of Dolenjske Toplice, very cloes to the hotels and only a few steps away from the Congress and culture centre. The ground floor of the boarding house contains the Oštarija restaurant which serves breakfasts, lunches and dinners. As our guest, you will also have access to a private parking space and a 20% discount on tickets for the thermal swimming pools in the Balnea Wellness center. Our apartments are spacious and pleasantly furnished. All of them have their own kitchen, bathroom, TV, air conditioning and Internet connection. The kitchen has a full assortment of kitchenware. There are towels in the bathrooms and bedding in the bedrooms. Apartment sizes range from 28 to 35 m2. One apartment for two or three people (studio) and five apartments for two to four people are available. The latter have a separate bedroom.